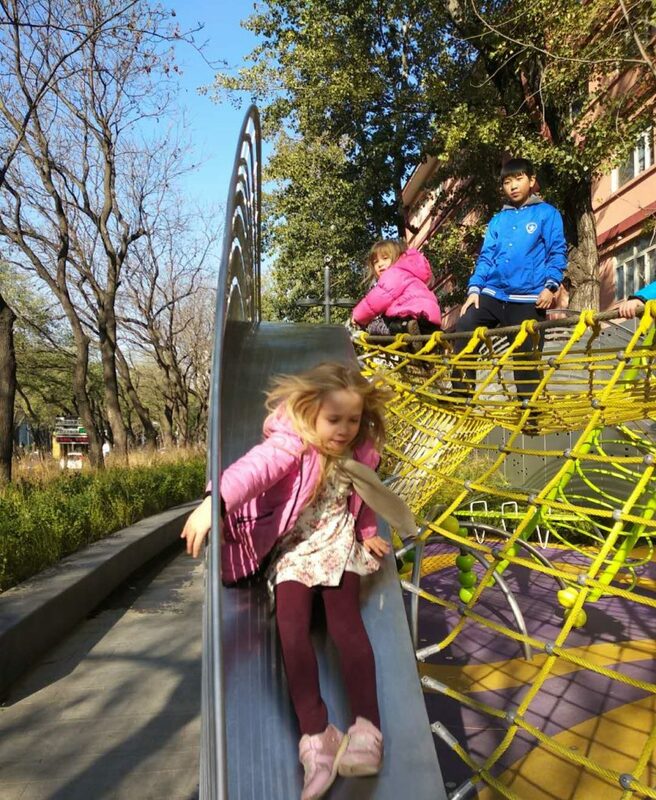 When I saw the new playground appearing in Sanlitun this fall I was very excited, for myself and my four year old daughter. This meant Sanlitun shopping would get a whole lot less boring, with the playground as a treat at the end. However, on a closer look, I was not sure if it was a very suitable playground. The design looked a bit too pretty; it gave me an unsafe feeling. But I as a parent put a great amount of trust in playground designers. They should know what they are doing, right? I put my iffy feeling away and let my daughter play several times, and then again last Saturday. 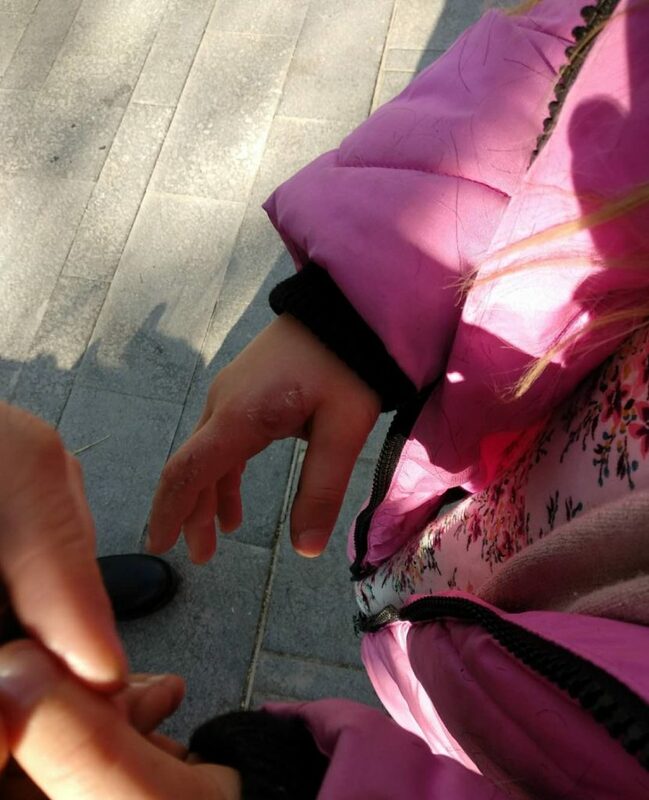 However, sadly my suspicion of a unsafe playground was vindicated when my friend’s daughter came down the slide and got her hand stuck in the side. When she got to the bottom we quickly saw that it was not just a little bump, she was badly hurt. 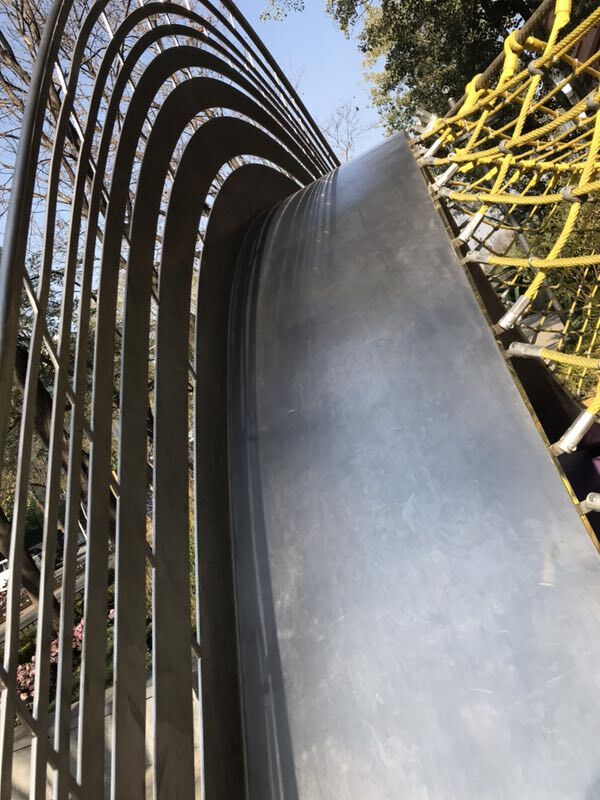 The slide has sides with many openings where little and big hands get stuck. 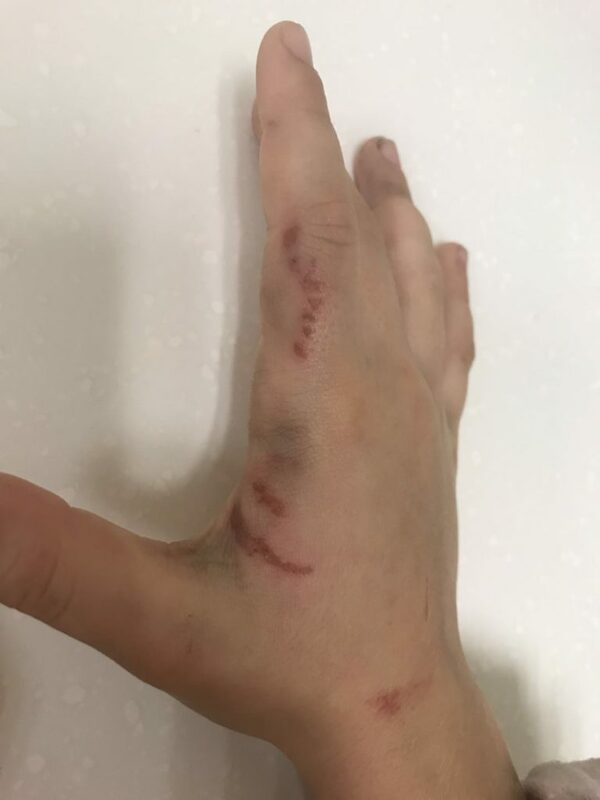 My friend’s daughter had to get a tetanus shot at ER and is fine, but accidents like this should not happen. Strangely enough when she came down the slide I took pictures, not knowing till I looked back what I had photographed. You can see what unfolded underneath on the pictures. We trust that playgrounds are safe and our kids can play without getting injured, but clearly this is not the case. The playground is situated across from 3.3 Mall and The Opposite House. 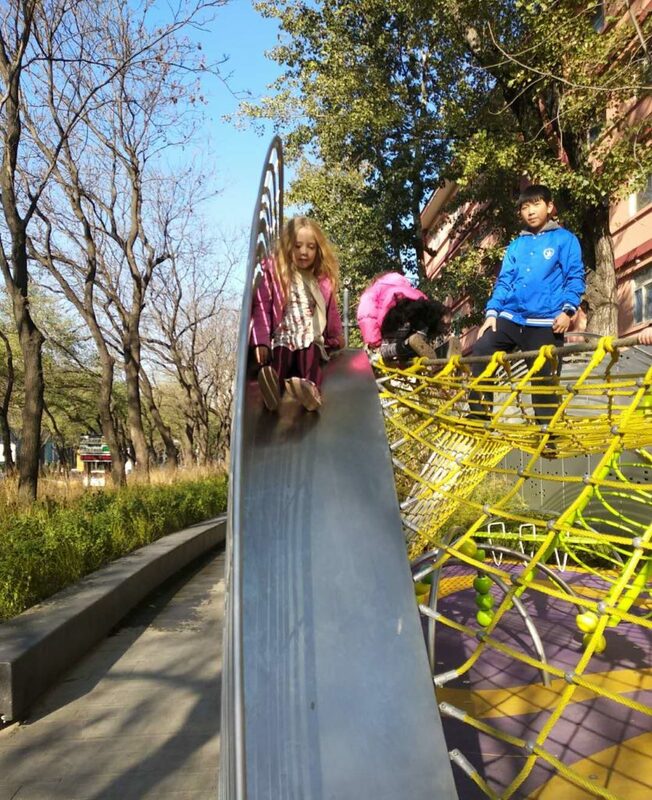 There is a sign which says “Opposite House Community Gardens”; however we inquired and the playground does not belong to the hotel but to “Sanlitun Street Administration Office”. We have tried to get in contact with them but as yet have received no response. Wow, we were playing there on Sunday! I noticed the slide rails, kept my son away. They look pretty sharp. Those need to be lined with perspex, to keep little fingers out. There are also some hoops with balls that slide over. They’re falling apart and are very sharp. The rubberised ground is also way too thin to provide much cushioning to a fall. The climbing net however, looks good. As does the climbing tunnel above it. I hope they gave her Tetanus Immunoglobulin (TIG) not the Vaccine. If they gave her TIG it would be locally, near or surrounding the wound site after cleansing. The Vaccine on the other hand would be in the deltoid muscle of the upper arm, and takes 2-14 days to gain full effect… and I am really happy you are publicizing this terribly designed park!! They need to fix these errors ASAP! !